Taliban & GOP: no difference. We pledge our influence toward a return to the original intent of the First Amendment and toward dispelling the myth of separation of church and state. They want a king to run our country, and not just any king, but a prince of the church. In other words, they want a mullah to run the country. Sure, it'll be a Christian Taliban version of a mullah, but it's still the same. They want the iron hand of Jesus Christ to run our country. No more sluts, no more fags, no more brown people. It's really that bad, folks. And while I'm at it, what's all this about Egypt having an "Islamic democracy"? This term is an oxymoron. Religion is authoritarian; democracy is the opposite. This concept implodes on inspection. (W)e support reducing taxpayer funding to all levels of education institutions. 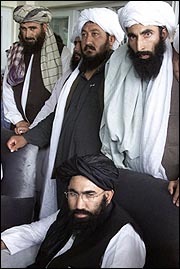 They are the Taliban in every way but one: X-out Allah; insert Jeebus. Done. Welcome to the new US of A.